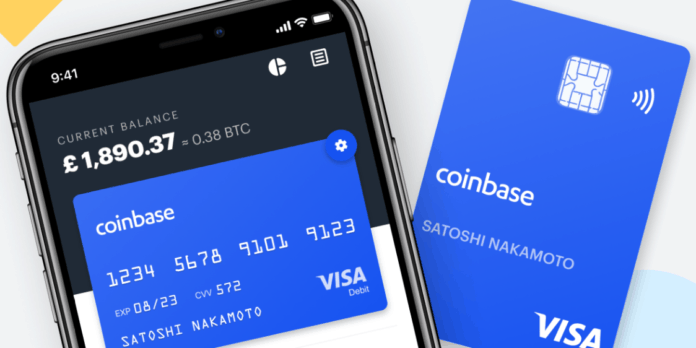 The cryptocurrency exchange Coinbase has recently revealed that it is now launching a Visa debit card. Specifically, this card will allow customers within the United Kingdom and the European Union to spend their cryptocurrencies directly from their Coinbase accounts. Moreover, Coinbase revealed this news in a blog post this past Wednesday. In the announcement post, Coinbase noted that customers with the ”Coinbase Card” will have the ability to spend cryptocurrencies such as Bitcoin, Ethereum, Litecoin or others just as effortlessly as if the cryptocurrencies had been fiat money in a regular bank. Furthermore, transactions will work so that cryptocurrencies are ”instantly” converted into fiat currency once the debit card is used to pay for a purchase. The card will feature support for contactless NFC payments, as well as using either chip or PIN, and will support ATM cash withdrawals. In addition to this, Coinbase notes that the card will reportedly be able to use in conjunction with all the cryptocurrency coins available on Coinbase. As such, the announcement reports that customers will subsequently be able to ”pay for everyday purchases” like booking train tickets or buying a meal. Previously, there have been similar types of cryptocurrency card products available – however, these have required customers to pre-load a specific amount of cryptocurrency onto the card in order to spend it. Along with the launch of this Coinbase Card, Coinbase is also rolling out a dedicated application, which will allow customers to specify what cryptocurrency wallets should be connected to their Coinbase Card purchases. What’s more, the application will allow users to receive instant receipts of purchases, transaction summaries, access to spending categories to better overlook purchases, and more. This foray into more traditional payment technology is notable, seeing as it could potentially open up cryptocurrency payments to a large swath of users who cannot wait for mainstream acceptance of cryptocurrency payments for everyday purchases. Author hiswai publishingPosted on April 10, 2019 Categories CompanyTags Coinbase, Coinbase Card, Credit cards, Cryptocurrencies, Cryptocurrency exchange, Digital currency exchange, Economy, EMV, Finance, Mobile payments, Money, United Kingdom, Visa Inc.